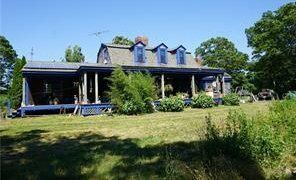 Country Colonial set on 2 plus acres of land. 5 Rooms, 3 bedrooms and 2 bath make up this well planned home that has many unique features. Two fireplaces, porch, solar panels and a detached artist studio with electricity and water. This property is located close to Sandy Woods and the Tiverton Library. Come see this unique and charming country home with much potential.